“Is there a white horse?” Amma wanted to know. 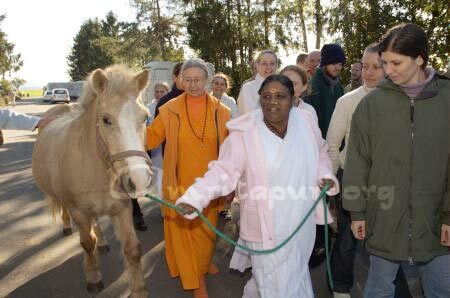 She was walking around a horse ranch in Odenwald, Germany, a property where many Ashram retreats have been held. The morning was bright and clear, the air was quite cold, and Amma was wrapped in a pink hooded winter coat. Soon, Vineeta, a young German woman who works at the horse ranch came leading a beautiful white horse by the reins. She led it up to where Amma was, and Amma began feeding the horse carrots and pieces of dry bread. Steam issued forth from the horse’s nostrils as it ate from Amma’s hands. About 40 devotees were gathered around, taking in another precious memory of time spent in the presence of the Guru. So, next a small tan pony was brought to Amma, and she fed that one as well. Then Amma went to a fenced off area on the east side of the ranch and there fed a tall black stallion and two brown mares. Another pony was soon brought, this time a black one. The horses snickered and brayed, each one trying to nose in towards Amma’s hands to get her treats. Situated on the break of a hill, the horse ranch provides a beautiful view of the surrounding village and the green pastures where the horses are allowed to run. Everyone looked out at that tremendous expanse, taking in its splendour. 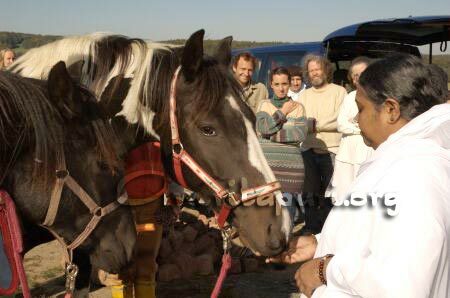 “Amma, there are more horses down there,” someone said, and soon Amma was walking off to the east side of the property where more horses were kept. The ranch keeps eighteen horses in all. There, Amma rested against a wooden fence, and fed those horses carrots and pieces of bread from her hands. After Amma fed all of the horses, she went back inside, where she sat and distributed bread, jam, and pieces of banana–this time to the devotees. “Everything Amma does is for that only,” Amma said. ‘Chittachora’ is one of the names of Lord Krishna. It means ‘One who steals the mind.’ This is what Lord Krishna did with the Gopis of Vrindavan. By spending all his time with these milkmaids, playing with them, joking with them, stealing their butter and milk, what he actually was doing was stealing their hearts. This is what Amma is doing when she spends time with all of you. She is putting a special pearl deep inside of you, so that you will remember Amma everywhere you go, whatever you are doing. “Normally when we begin a long, hard task, we will be tense the whole time. The only peace we get is when we think; ‘I will get rest once the task is completed’. By providing the devotees with memories, deep inside they will always be thinking of me no matter what they are doing.” Amma added that such thoughts–the moments when the disciple thinks of being with the Guru–are moments of peace and rest. Amma then explained how in the path of advaita-vedanta, one tries to see the whole world as an extension of oneself, and how in the path of bhakti, one tries to see the whole world as their Beloved Lord, or Guru. The two paths are not different, just slightly different ways of looking at the same thing. 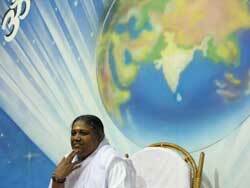 “In today’s world, people run to hear talks on Vedanta, but here we try to live Vedanta,” Amma said, referring to how she encourages her devotees to serve the world, seeing it as an extension of Amma, or an extension of their own Self. “At the heart of all religions is the Guru-disciple relationship. It doesn’t matter whether it is Islam, Christianity, Jainism, Buddhism, or Hinduism,” Amma said. “In reality, this relationship is the relationship between the jivatman and Paramatman, the individual self and the Supreme Self. In truth, they are one and the same. When standing on the shore, a river appears to have two separate banks, but in reality those two banks are one and the same at the bottom of the river. Once we remove the water (the ego), we will realize this truth. Advaita it is such a simple word. It means “not two.” But within this simple conjunction is cradled the entirety of spirituality. It is the reminder that things are not diverse, as they seem, but One. Man and Nature? Not two. Creator and Creation? Not two. Inside and outside? Not two. God and devotee? Not two. Guru and disciple? Not two. Atman and jivatman? Not two. You and I? Not two. This Friday, Amma was talking to all the ashramites about how imperative it is for them to go beyond their identification with their ego—their sense of being a limited mind, body and intellect existing separate from others. “We need to see ourselves in others and act accordingly,” Amma said. As an example, Amma cited the nine temporary shelters the Ashram has constructed for tsunami victims in Srayikkad. Amma said, at one point She told him to make sure and get some sleep. But he said he couldn’t, as he knew that every hour the shelters remained incomplete was another hour the evacuees had no place to rest their heads. “Because he was so identified with the suffering of others, he was able to transcend his physical and bodily needs,” Amma said. Perhaps this is why the Ashram completed its first five shelters on January 13th and its ninth on the 25th—whereas the government has yet to finish one. 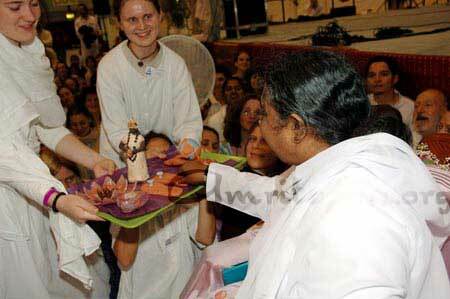 “A mother never tires of taking care of her children because she considers them here own,” Amma concluded. She then called all the visiting devotees to come quickly for darshan, as She had much work to do and meetings to attend regarding the relief work. The danger is over. But the damage has been done. While no one at the Ashram was injured, the villagers have suffered great losses. Family members are dead and missing. Many of their houses and huts have simply been washed away. The government has evacuated the area, asking everyone stay on the other side of the backwaters for the next 48 hours. Under Amma’s instructions, relief camps have been set up at both the Amrita University School of Engineering and at the new Ayurveda School. More than 3,000 evacuees are being accommodated there. Five villagers in the neighbourhood were killed; at least 150 in Kollam District. More bodies are being discovered every hour. When one considers that there were more people in the Ashram–20,000 at the time–than in the entire Allappad Village it shares the peninsula with, it can only be grace that none of them were hurt. The ashramites are also homeless for the time being, having taken with them only the clothes on their backs. But they are making sure the villagers are all right–that they have straw mats to sleep on, that they have food three times a day, that they have water and milk. In the middle of the night, Amma even asked them to give up the mats they were sleeping on for the use of the villagers. The government has set up relief centres in nine of the area’s schools, and it is Amma’s Ashram that is providing those centres with food and other necessities like clothes and blankets. Six ambulances from the Ashram’s AIMS Hospital, with medical teams lead by 10 doctors are making regular rounds. They are visiting each camp every two hours, 24 hours a day. In all, the Ashram is preparing food for 10,000 people, three times a day. The brahmacharis are cooking the rice, uppama and curries, and the brahmacharinis and many of the devotees from around the world are busy chopping vegetables. The food is then being carried in Ashram trucks to the relief centres. The brahmacharis are also delivering sacks of uncooked rice for distribution, as many people’s food supplies have been washed away. All along, it has been Amma Herself that has been directing the relief efforts. As soon as the water rose, Amma stopped giving darshan, wrapped Herself in a yellow shawl and began giving instructions from the temple balcony. She then came down into the water and started personally seeing that everyone was getting to safety. At one point, brahmacharies rescued some 50 people who were stranded on top of a house and could not swim. They extended a plank from the Ashram kitchen to their roof and helped them across. Amma made sure that everyone in each family was together before sending them across the river in the boats. She was concerned that if they did not cross as families that they would get separated and not know where the rest of their loved ones were or if they were ok.
First the villagers were sent across, then the devotees and then the ashramites. The elephants and cows were sent around dusk via the Beach Road Bridge. Amma was the last person to leave the Ashram. She only left because She knew that if She did not leave, some of the disciples also would not. When Amma reached the other side of the backwaters, it was past midnight. She then started further organising relief work, telling groups of brahmacharis where to go and what to bring in order to take care of the people. This morning Amma visited the relief camps set up by the Ashram, consoling all the people there and inquiring about their homes and families. She then visited the families of the deceased. The Ashram is also actively involved in relief operations in Cochin (Vaippin), Trivandrum, Chennai and Pondicherry. Amma has told all the Ashram branches throughout South India to help in the relief efforts. The guru-disciple paramparas1 of India are like malas2 strung with gems; each jewel is precious and invaluable. Still, some shine with an attention-commanding splendor. Sri Adi Sankaracarya was such a diamond. Sri Sankara’s accomplishments were many, but he is singled out because his brilliant commentaries on the prasthana-trayam—upanishads, the Bhagavad-Gita and the Brahma Sutras—crystallized the Advaita Vedanta Darsanam3 forever, establishing it as the ultimate message of the Vedas. During his short life of 32 years, he travelled the length and breadth of India, on foot, engaging in debates with the leading proponents of the other Indian schools of thought. His various opponents—including the Purva Mimamsakas, who professed that the Vedas’ prime teaching was the performance of rituals for the attainment of heaven and otherworldly splendor—were knocked flat, as Sankara laid bare the defects of their philosophies with his one-two punch of scriptural authority and logic. As per tradition, once defeated by Sankara, they became his disciples. As Amma herself says, Advaita is the ultimate truth—the inherent darsanam of the Vedas. Therefore, it should always be remembered that Sankara is not the father of the Advaita Vedanta Darsanam. The advaitic knowledge flowed down to Sankara from an illustrious parampara that includes not only Sankara’s direct guru, Sri Govinda Bhagavadpada, and grand-guru, Sri Gaudapada, but also Veda Vyasa4; its origin being the Almighty. Nor was Sankara the first to create Advaitic commentaries on the prasthana-trayam. This is something that Sankara himself never failed to acknowledge. Due to the commandment of Govinda Bhagavadpada, who instructed Sankara to compose commentaries and propagate them throughout India, Sankara became Advaita’s Jagadguru—world teacher. For, even though Sankara himself never left India, his commentaries on the prasthana-trayam have been translated into dozens of languages and are today studied throughout the world. The acceptance of Advaita Vedanta as the ultimate truth professed by the Vedas has become so widely accepted that the word Vedanta itself has become a synonym for Advaita. With each passing year, the vision of Advaita Vedanta gathers more and more acceptance throughout the world. Perhaps one day it will truly become, as Swami Vivekananda predicted, a universally shared worldview. Sankara laid bare the defects of their philosophies with his one-two punch of scriptural authority and logic. Most scholars agree that Sankara lived between 788 and 820 CE, although some say he was born as early as 77 BCE. Regardless of the date, all agree he was born in Kalady, which today is in the Ernakulam District of Kerala. 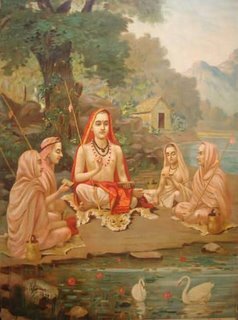 He was initiated into Vedic study at five and mastered all four Vedas by eight, at which point he took sannyasa and headed north in search of a guru. On the banks of the Narmada River [in modern day Madhya Pradesh], he met the sannyasi who was to become his guru, Govinda Bhagavadpada. According to legend, when Govinda Bhagavadpada asked Sankara for his identity, the child burst forth with a spontaneous composition of 10 Sanskrit verses (today referred to as the Dasa Sloki), in which he illustrated the profundity of his wisdom and inner experience. He was immediately accepted as a disciple. The legends associated with Sankara’s life are many and fantastic. Whether they are pure fact or not is not germane. For even if they are not true, they are Truth; the adamantine principles and reality they demonstrate have the power to uplift us. More relevant are Sankara’s actual accomplishments. To say they were vast would be an understatement. Aside from his commentaries and hymns, he also wrote many prakarana granthas5, including Vivekacudamani, Atma Bodha and Upadesa Saahasri. His mastery of Sanskrit was unparalleled. Unraveling the twists and turns of his poetic slokas is simply exhilarating. His verses are not only majestic and multi-faceted, but also of unfathomable depth. It was as if the language were his very breath. Furthermore, it should be noted that Sankara is said to have put down his pen at age 16. Aside from his compositions, Sankara’s sanmata6 division and panchayatana7 system of worship, helped reintegrate a Hinduism that was in danger of fracturing into various cults, showing the various gods and goddesses to be but different personifications of the one ultimate reality. In many ways, Sankara was India’s first monastic organizer. He empowered the sannyasa tradition by revitalizing the dasanami structure, wherein monks were organized under 10 titles8. And to protect and propagate Sanatana Dharma, he established asrams throughout India, including four primary such institutions: one in Sringeri, Karnataka (southern India); one in Dvaraka, Gujarat (western India); one in Puri, Orissa (eastern India); and one in Jyotirmath, Uttarakhand (northern India), putting each one in charge of preserving a particular Veda. Towards the end of his life, Sankara ascended to sarvajna-pithams9 in Sri Nagar [Kashmir] and in Kanchipuram [Tamil Nadu]. Reflecting upon Sri Sankara’s life—which was the epitome of sannyasa—should annihilate any wrongheaded notion that renouncement of action is the crux of Hindu monasticism. As Sankara demonstrated, both in deed and word, what requires eradication is not action but the misunderstanding that one is the actor. Cidananda rupah sivoham sivoham—’I am consciousness-bliss. I am Siva. I am Siva.’ Sankara did not only pen this composition; he lived it. And having done so, he left his body at the mere age of 32, having ensured the truth of Advaita Vedanta would thrive not only in India but throughout the world. 3 The Non-Dualistic School of Thought based on the Upanishads found in the Vedas. 4 Among other accomplishment Vyasa is the author of the Brahma Sutras and codifier of the Vedas. 5 New compositions that serve to further illuminate the ideas expressed in the Upanishads. 6 Organizing the unwieldy Hindu Pantheon into the primary godheads of Siva, Visnu, Sakti, Ganesa, Surya and Skanda. 7 A type of puja wherein one simultaneously worships five deities, understanding that they are but multiple representations of the one supreme reality. 8 The 10 titles of the dasanami are Sarasvati, Tirtha, Aranya, Bharati, Asrama, Giri, Parvata, Sagara, Vana and Puri. 9 In order to ascend to a sarvajna-pitham—the Seat of the all-knowing—one must submit himself to, and satisfactorily answer, all questions posed by the a body of philosophical pundits, representing all schools of thought and fields of knowledge.